One of the first items of clothing I made in Alabama were these pyjama shorts for Adam. 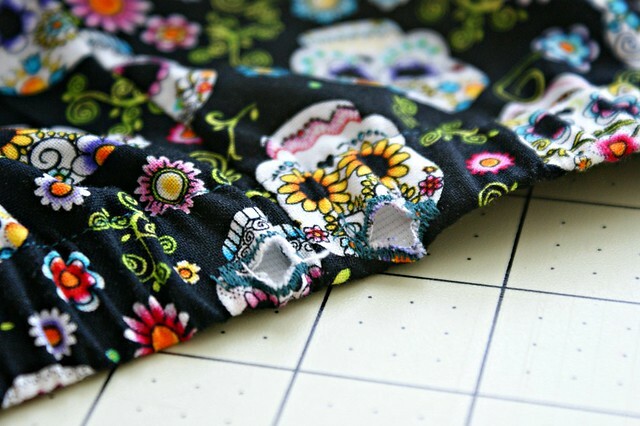 Adam chose a ‘Day of the Dead’ themed fabric; I made the shorts and he loves them. I’m not really sure why we both have such an attraction to Day of the Dead themed things and sugar skulls. The patterns can be so intricate and I like the fact that something that can be so sombre is made into a celebration. One day, I would like to travel to Mexico and take part in the celebration, which happens over October 31st and the beginning of November. 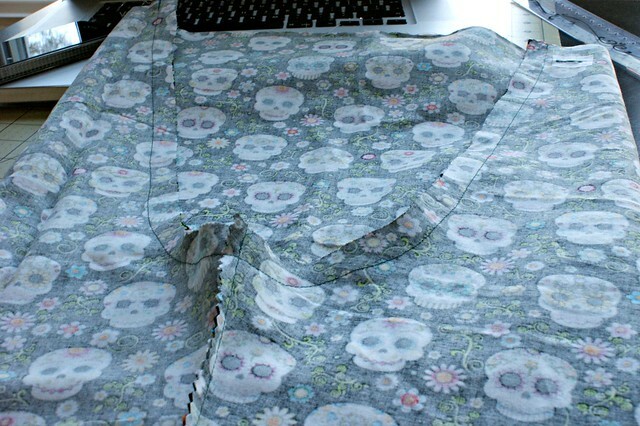 Anyway, we found some more fabric that was heavily printed with sugar skulls. We both loved it even though it was more expensive at $9.99 per yard. This time Adam requested some long pyjama bottoms and a matching top. I bought 2.5 yards which just covered the bottoms due to the direction of the print, something that I never really thought about when purchasing. This means that the shirt will be made at a later date, possibly when I get a coupon for Joann’s. This is the pattern that I used for these pyjamas. I didn’t pay full price for it either… I used a coupon! Despite finding this pattern quite easy last time, I chose to make a couple of changes. 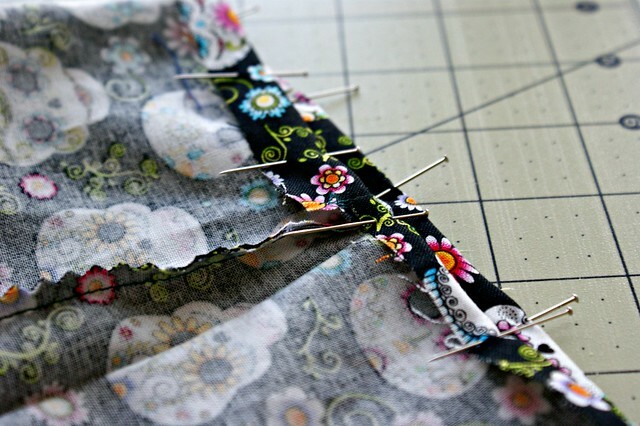 The first instruction in the pattern requires you to make two button holes for the drawstring that is added at the end. I chose to use a piece of heavy weight interfacing on the wrong side of the fabric, where the button hole would be stitched. When inserting the drawstring, these holes are tugged about quite a bit, so this adds a little extra stability. Once the side seams were sewn, I pinked the inside seam to avoid fraying. 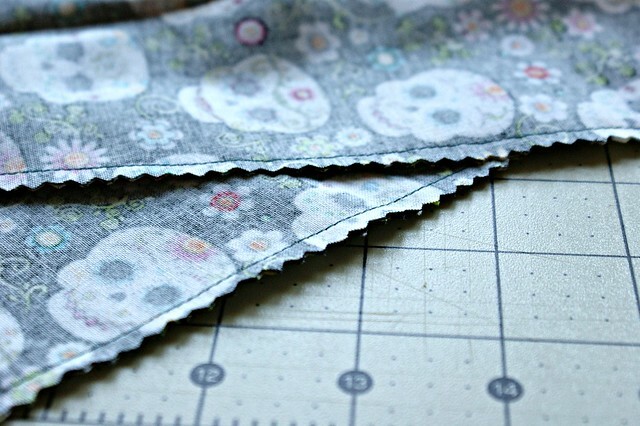 I would love to own a Serger but I don’t yet so pinking will do for these! The part that I find the strangest, is when you put the legs inside each other to sew the crotch. I have to check that I have done this right quite a few times before I stitch! The waistband is an easy folded hem; wide enough for the elastic. 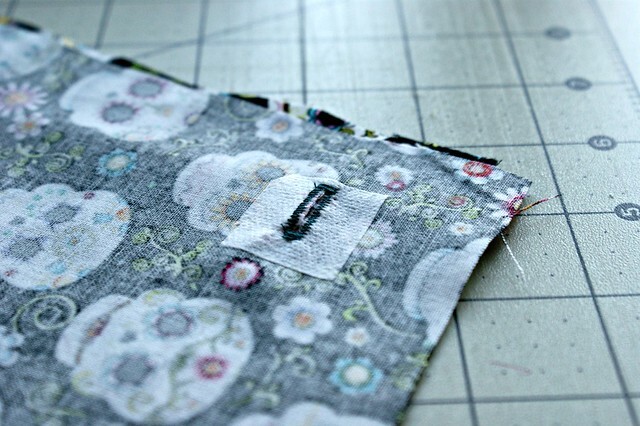 When stitching the hem down, I left a gap so that the elastic would be easy to insert. 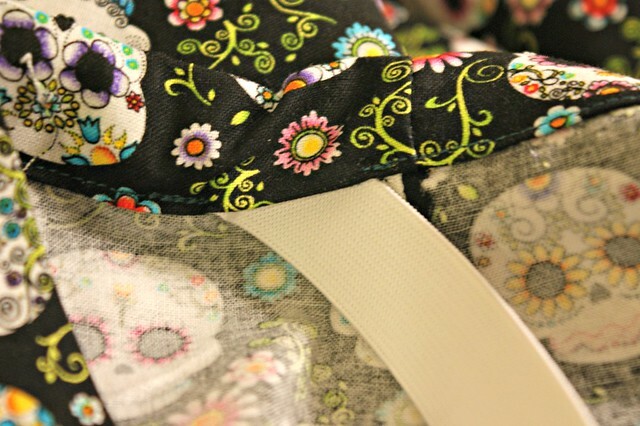 The drawstring is then threaded through the button holes that were made at the start. It needs to be threaded towards the front of the elastic though or otherwise you end up with a tangled mess within the waistband. Finally, the bottoms of the legs are hemmed. I did mine 1/4″, followed by another 1/2″ and topstitched. If your folds aren’t even (like mine) just make sure that the hem is straight; you might need to fold over more in some places. Another finished pair of pyjamas, with a few lessons learnt from the last time this pattern was used. 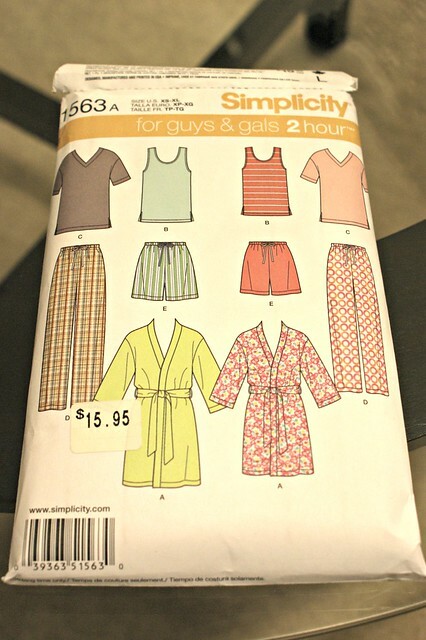 I would still like to make the dressing gowns from this pattern and maybe the tshirt using a stretchy fabric. These look great, well done. Again, I love the fabric. $10 per yard is still a bargain, you should stock up, and consider and export business – seriously! Do you think you will make a buttoning shirt top to match? Is it similar to the one I have? Adam didn’t fancy modelling them for us then??! He will be later in the week 🙂 he got back from Ohio late last night and wasn’t in pyjama modellin mode! Haha!